Black Diamond Vaporlock Carabiner. An ultralight, pear-shaped locking biner that’s ideal for long free climbs and slimming your rack, the VaporLock Screwgate strikes the perfect balance between weight savings and function. 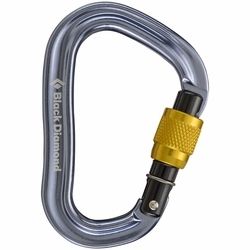 Black Diamond's lightest full-function pear locker, the Black Diamond VaporLock carabiner provides a smooth increase in friction and is ideal for belaying and rappelling when you want more control.